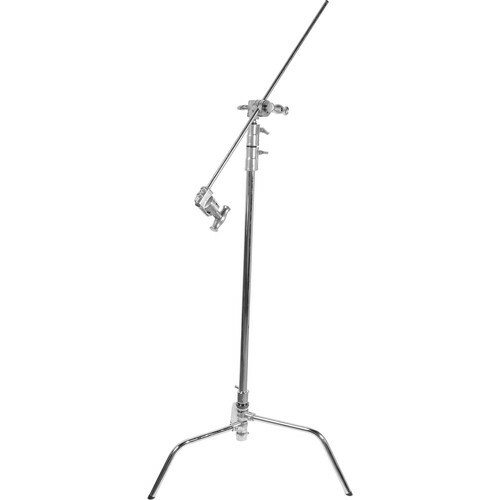 Turtle Base C-Stand Kit - 10.75' (Chrome) is rated 4.8 out of 5 by 321. Rated 5 out of 5 by M. Gantt from Exceeds expectations I thought I was just ordering simple C-stands not unlike the ones I used in film school. But once they arrived and I assembled them, I knew I had purchased some of the best C-stands out there. Super sturdy and reliable. The grip handles are larger, and this makes using them even better. The best feature, however, is the slip-ring at the bottom for the legs. You just pull it up and let the legs swing out, into place, then release the ring and they are locked into place. How easy is that!? Plus, I used them for lighting this past week and had a 1k light attached to the arm, they are so strong and sturdy I didn't even need a counter-balance for the light. Great product. Rated 5 out of 5 by Cooper from Very heavy duty and sturdy I own a Video Production company and C Stands are thing I use on a daily basis. Deciding which brand to go with is the tough part! I've been very happy with this purchase. It's a bit heavier than a usual Matthews brand stand, but that's not necessarily a bad thing. It does a nice job and is nice and sturdy. The parts seem high quality and everything tightens together very nicely. The black finish is also looks good, too. I use it a lot as a boom to get a light above my talent for a nice rim light. It holds the weight very nicely when extended all the way out. Just be sure to through a sand bag on it! Overall would totally recommend. Rated 3 out of 5 by Anonymous from Sticky Yes, it's heavy, but I view that as a good thing. Could be sturdier. The Stand itself is good. I like the base locking mechanism for the legs. It really makes that portion of the set-up a breeze. Unfortunately, every second you gain from that and then some is lost when the grip heads stick... and they do stick. You need to keep a long, thick screwdriver on you at all times to pry it loose. Like at least one other reviewer has mentioned, in the future I think I'll just get the stand alone and buy some Avenger, Manfrotto or Matthews Grips to go along with it. Rated 4 out of 5 by Aki from Great value, however... I purchased this kit because of the irresistible price. The stand is well made and more than worth the money.However the grips are poorly made. They often get stuck holding things tight. When that happens you'll need some tools to get them to open. Can't afford to have that happen on location shoot.You are getting the grip and the extension arm for $20 (compare to just the stand), so can't really complain. I'll just purchase the stand alone and get Avenger grips next time though. Expertise: Professional Problems Encountered: Grips get stuck. Rated 5 out of 5 by Anonymous from Heavy duty, excellent value. I am a professional photographer and occasional videographer and often use c-stands on set for either type of project. These c-stands are extremely heavy duty and durable. They are taller than most of the matthews or avenger c-stands I'm used to using and they are also most definitely heavier (which is exactly what you want in a c-stand). The quick-lock mechanism on the turtle base is very handy, although I am curious to see how it holds up in the long term. It appears to be well manufactured, so only time will tell. If I had to say something bad about these stands is that they might actually be too heavy... but that's what assistants and grips are for right? Rated 5 out of 5 by JAM Photography Inc from The Stands are AMAZING!! I couldn't be happier than I am with these Impact stands!! Yes, they're heavy, but I shoot a lot of my work outside on location, and the weight keeps them from being top heavy. I can set them up as high as they go with a couple sandbags and a smaller (2x3) sofbox, and they never budge. I'll be buying the shorter version next, as well as the Roller Stand with the folding base for my studio. Great Product!! Rated 5 out of 5 by Motographer from Thereal deal! I wanted at least one SOLID highly articulated stand to positively and precisely position my speedlites and modifiers. I was tired of my spindly lightweight cheap stands topling over at the slightest breeze. This stand is the REAL DEAL! ALL STEEL. HEAVY BUT SOLID.A lifetime purchase.I've discovered the spend money once philosophy: Cheap stands and tripods used to fill my closet. Once correctly positioned; the extension arm stays tight and doesn't flex. Buy pro gear Once and go shoot. This stand will last a lifetime of serious use. Best in a studio. because you have to hire a sherpa to lug it around. It should easily handle any monoblock strobes/modifiers I grow into. Rated 5 out of 5 by Russell Kilgore from Great stand, great price! When I was looking to purchase my first set of c-stands, I went back and forth about which brand to purchase. With a tight budget, I saw these and decided to give them a try. What a great decision on my part! I was pleasantly surprised by the construction quality. I have since purchased additional stands in both black and chrome. Compared to other brands, these are a bit heavier but I don't mind the added weight. I feel confident that my lights are stable and secure when in hear stands and I'm pretty sure that I'll purchase more of these stands in the coming months. How long is the riser at its minimum/collapsed height (w/base detached)? I've never used a C-stand before. I have a Flashpoint Xplor 600 and a variety of modifiers. Is there anything additional that I would need to mount the strobe to this stand? Any help would be greatly appreciated! If mounting the light to the grip head end of the extension arm, the Impact SRP-113 Long Double Stud 5/8 B&amp;H # IMSRP113 would be needed. Otherwise, if you wanted to mount the strobe directly to the stand, you would remove the extension arm and place the strobe on top of the 5/8 stud there. Either way you go, using some counterweights such as the Impact Saddle Sandbag (15 lb, Orange) B&amp;H # IMSBFO15 across the legs is ideal to keep the stand stable. Please see the image below for reference. As this center is detachable, are there any bases with wheels you can buy and combine with this C Stand? The column of this stand is detachable from the base. For a wheeled base that will fit the column, you've got the Manfrotto 299BBASE Wheeled Light Stand Base with Universal Head B&amp;H # MA299BBASE. Please see the image below. They are very similar, but the Impact is priced lower. I want a c stand to do 1 to 1 macro so very close to someone face laying down. Is there one that goes low and shoots overhead this close? The easiest way of obtaining a low angle for macro work is to use a tripod with lateral column, set very low to the ground. One such tripod is the Manfrotto MT055XPRO3-3W Aluminum Tripod with 3-Way Pan/Tilt Head B&amp;H # MAK055XPRO33. Is there a longer boom that will work for this? A longer boom arm that can be used with an Impact C-stand is the Impact Boom Arm (Chrome-plated, 86 ) B&amp;H # IMLSABAS. Please see the image below. Will this stand support a White Lighting X3200, and the Paul C. Buff 47in Octabox? Yes it will, and also use a sandbag just to keep the base even more steady. You can detach the column from the base and insert the column into a wheeled base like the Manfrotto 299BBASE Wheeled Light Stand Base with Universal Head B&amp;H # MA299BBASE. Please see the image below.